York Cemetery is very varied in its landscape and atmosphere and it is important to us that you choose a grave plot in an area that is right for you. 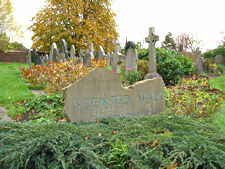 New grave plots are available in both the Victorian and Modern Sections of the cemetery. New plots may be purchased either for full burials or for interment of cremated remains. Old graves can be opened provided it can be established that the executors of the person to be buried have rights to use the grave or that the person with the Burial Rights has given permission. It must also be established by the Cemetery Warden that space is still available. People authorising burials in existing graves who are not the owner on record will be advised after the interment to have Burial Rights transferred into their name. Please note:’Burial Rights’ (i.e. the right to determine who may be interred in a grave) are those which the owner of a grave gains when purchasing or completing a transfer of a grave. The ground itself remains the property of the Trust and is subject to our regulations. For further information on this subject, please contact the Office Administrator.